In alignment with terminology used by other vaulting organizations and to more accurately reflect the variety of movements taught and tested, the PATH Intl. Interactive Vaulting Subcommittee has recommended that the term "compulsories" be replaced with "vaulting positions." All PATH Intl. Interactive Vaulting materials will be updated accordingly beginning in July 2016. Hear Ye! Hear Ye! Registration Now Open! Registration for the 2016 PATH Intl. 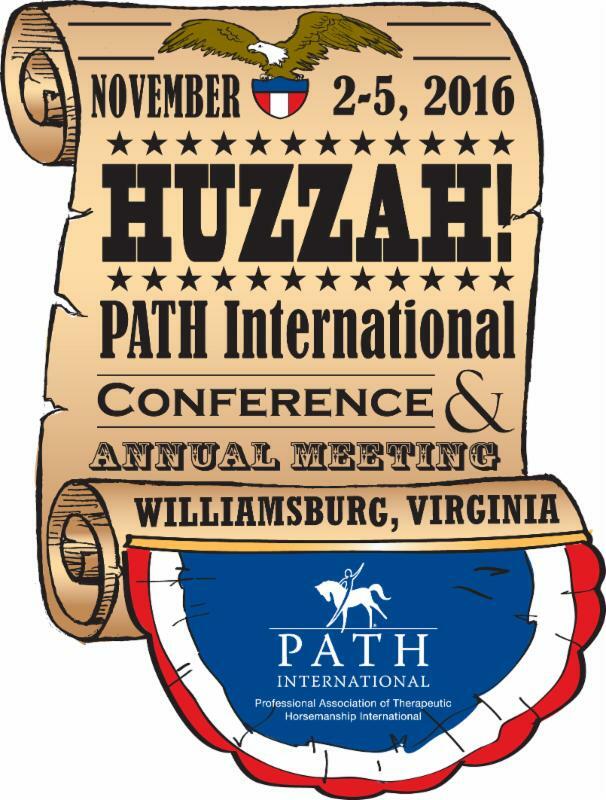 Conference and Annual Meeting, presented by title sponsor Purina, November 2-5 in Williamsburg, VA, is now open. Click here to register and pick your sessions. Did You Know? George Washington, a frequent Williamsburg visitor, did not sign the Declaration of Independence. In July 1776, he was in new York preparing to defend Manhattan against the British. Come to Williamsburg and discover the heritage and history of America's birthplace. New this year: Reserve a table of 10 at the 2016 PATH Intl. Awards Banquet, November 4, 2016, for $50 per table. This non-refundable fee will benefit the PATH Intl. Disaster Relief Fund, which has been seriously depleted due to many requests this year, but it will also create a better system for tracking and assigning tables. Please mark the table reservation on your online registration or on your registration form through October 10. (Don't forget to include the name(s) you would like on the table.) There will also be a signup sheet on site in Williamsburg at the registration desk through noon on Thursday, November 3. Phone confirmations will not be accepted. If you have questions, contact Jaime Covington. If you have items you would like to donate for the conference's silent auction or know of someone who does, download the donation form, fill it out and return to Barb Ford. Do you have a product or service equine professionals would be interested in purchasing? Educational materials, books/videos, stable or horse equipment or business consulting services are all great possibilities for selling to the 800+ therapeutic horsemanship professionals we expect to see. Click here for information or email Cher Smith. As most of you know by now, one of the major initiatives in the PATH Intl. strategic plan is to achieve independent, third party accreditation of the PATH Intl. Registered Therapeutic Riding Instructor Certification in order to provide validation that our certification meets recognized credentialing standards. For a refresher on this this objective, read the Winter 2016 PATH Intl. Strides article. As mentioned in that article, one of the first major initiatives was to conduct a job task analysis (JTA) in order to verify the knowledge, skills and abilities a newly certified PATH Intl. Registered Therapeutic Riding Instructor should possess. This three-week PATH Intl. online education course offers instructors an understanding of spinal cord injuries conditions and how to apply this knowledge to the development of safe and effective equine-assisted activities and therapies (EAAT) lesson plans. Course curriculum will focus on integrating new ideas for offering a participant-centered approach to planning and facilitating EAAT. This three-week PATH Intl. education course will offer instructors an understanding of basic military culture, terminology and common reasons that veterans and service members seek out EAAT. Learners will develop communication skills, center policies and processes for participant assessment, planning and identifying precautions and contraindications. For research purposes, we are hoping to interview a handful of our members who are also special education teachers. The subject is how to best connect with this important group at a national level for the purpose of sharing with them the benefits of EAAT and the importance of directing their students/families to PATH Intl. Member Centers and Professionals. The time required would be less than an hour initially with the potential of a workgroup being formed at a later date. Interested parties please email Kaye Marks, PATH Intl. Director of Marketing and Communications. Thank you in advance. A fundamental piece of our teaching is to explain how to read a horse's body language. Here is a study that may lead you to in-depth new approaches to this subject with your students, validating the horse's ability to communicate in ways we often overlook. Read more. The PATH Intl. Equine Welfare Committee is committed to refining and deepening our perspective of equine well-being to include the physical, mental and emotional well-being of our wonderful four-legged partners. Join us on this journey. Please add your thoughts on the PATH Intl. Community Connections page. It is our desire that these tips start a further discussion on Community Connections. Any thoughts? We appreciate hearing from you! Region 8, August 4-7, Tyler, TX -- Click here for a downloadable registration form. Deadline to register is Friday, July 22.